In an entry for a Philadelphia Phillies blog, Tim Johnson wrote, “Tully Sparks pitched in baseball’s earliest days, a time when hitting was as poor as the players themselves.”i A good line, though one can quibble as to how early in baseball history 1895-1910 truly was, or how poor some of the hitters may have been. 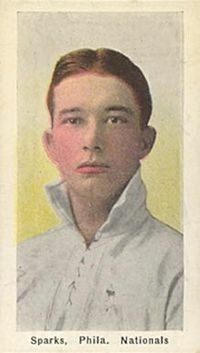 Sparks himself pitched 12 years in the major leagues and recorded a career earned-run average of 2.82, with three exceptional years, 1905 through 1907. Tully’s father, Linton Sparks, had been a dealer in fertilizer at the time of the 1870 census (four years before Tully was born), living in Athens, Georgia, with his mother and eight younger brothers and sisters. The census indicates that the mother had an estate valued at $30,000 and a domestic servant, too. All the children may have eaten away at the estate; ten years earlier, Linton’s father (also named Linton) was a farmer who had an estate worth $50,000. He was considered “the young collegian” and described as having “untold pounds of steam behind his balls, good curves, excellent control, and phenomenal support from the balance of the nine.”iv In 1896 Sparks pitched for Birmingham and Mobile in the Southern Association, with a combined 15-17 won-loss record. (Birmingham disbanded on August 14.) Sparks led the league with 160 strikeouts. The Atlantic League was home in 1898, and Sparks pitched for the Richmond Bluebirds, who – like Galveston in 1897 – finished first in their league. At the end of September Pittsburg worked a deal for Sparks and teammate Spike Shannon. But another year took Sparks to another city, and 1900 was spent with the Milwaukee Brewers in the American League (still a minor league that season) under manager Connie Mack, after Mack bought Sparks’ contract from Pittsburg in February. Sparks was 16-12 with 30 complete games in 34 starts, throwing 261 innings. In 1901 the American League became a major league and the Brewers, working under manager Hugh Duffy (Mack having left to establish the Athletics in Philadelphia), the Brewers finished last in the eight-team league (49-89). Sparks was 7-17, with a 3.51 ERA, hurt by being upside-down in strikeout-to-walk ratio, 62 K’s and 93 BB’s. The Giants were a last-place team in 1902, however, 48-88, and Sparks’s winning percentage was not even that good, 4-10 with a 4.17 ERA. He was, perhaps, used too frequently, “suffered from overwork” in the words of the Washington Post.x The Giants went through two managers in the first half of the season before enticing John McGraw over from the American League to take over as skipper for the final 63 games. Not all the games were that good. Tully was lit up a few times as well, but his best game of the year was likely another four-hitter against the Browns in Boston on August 23, a 1-0 victory that ran ten innings. The Globe wrote, “Mr. Sparks, who failed to please the lovely Mr. Freedman in New York, was on the rubber for Boston, and his work was heady and as full of shoots as a roman candle.” He had excellent support on defense, and collected a couple of hits himself, a double and then a single to left field in the bottom of the tenth that advanced Lou Criger to second base. Patsy Dougherty then hit one between shortstop and second base, scoring Criger with a yard to spare. Sparks was never a good hitter. In his 12 years in the big leagues, he hit for a .115 average, and had a .172 on-base percentage. He drove in 45 runs in his 314 games, and scored 45 times. As it happens, Sparks finally found a baseball home. After all his travels from one team or another, he played with the Phillies for the remaining eight seasons of his career, 1903 through 1910. In every one of them, save the 15 innings of work in the final year, he posted earned-run averages that never reached as high as three runs a game. Including the nine earned runs he gave up in the one game he pitched in 1897, his career ERA with the Phillies was 2.48. He won the same number of games as he lost, 95-95. When Sparks came to Boston, it was to pitch as a visiting player at the National League park. Just as he’d won 11 games in 1902 for the New York Nationals and the Boston Americans combined, in 1903 he won 11 for the Phillies, losing 15, with a team-best 2.72 ERA. The Phils finished in seventh place. Despite a marginally better 2.65 ERA, the best on the team for anyone throwing 100 innings or more (Sparks threw 200? innings), his won-loss record was just 7-16. This was a last-place team with a 52-100 record (53½ games out of first place) for manager Hugh Duffy (who’d managed Sparks in 1901 at Milwaukee). Over the next three seasons, Sparks pitched brilliantly. His 1905 ERA was 2.18 and he was 14-11 for the fourth-place Phils. One game in particular helped his earned-run average considerably, though it ended in a loss. On August 24 at Philadelphia’s Baker Bowl against the visiting Chicago Cubs, Sparks and Ed Reulbach were both about as stingy as could be, neither of them allowing a run for the first 12 innings. A triple and a single resulted in an earned run being charged to Sparks, but the Phillies tied it on a base hit, a sacrifice fly foul ball, and another hit. Both pitchers were still going into the 20th inning, when a single, a sacrifice, and a hit up the middle scored another one for Chicago, and Philadelphia failed to score. Sparks was 0-for-7 in the game, leaving for a pinch-hitter in the bottom of the 20th. In 1906, Sparks lowered his ERA by two hundredths of a point, to 2.16. He won 19 games, tops on the team. But he lost 16, and the Phillies still finished fourth. Sparks was 16-15 in 1908, with a 2.60 ERA – but the team’s ERA was a superb 2.10. In 1909 Ring Lardner called him “Sparks the Mysterious,” describing him as “Frank Sparks, called mysterious because his fast ball looks slow, and he telegraphs his curve and it is hard to see why you can’t hit over the fence everything he pitches…”xiv Batters did indeed have a difficult time hitting his balls over the fences, but the four homers he allowed in 1909 tied for the most he’d given up since he gave up six in 1902. He allowed 33 homers in 314 major-league games, an average of less than three per year for the dozen years he pitched in the big leagues. Sparks’s career ERA was 2.82 in his 314 games and 2343? innings pitched. In 1911 Sparks pitched for Montgomery and was 18-11 in Southern Association play. In February 1912 he let it be known that he had retired from the game, and was in the real-estate business in Chattanooga. After Sparks left the game, we lack much information. At the time he registered for the draft during the first world war, he lived in Cave Springs, Georgia, and worked as a bauxite miner for the Asbury Sparks Company with his brother Hal. The 1930 census has him working as a bookkeeper in a paint store and living in a boarding house in Atlanta. In addition to the sources noted in this biography, the author also accessed Sparks' player questionnaire from the National Baseball Hall of Fame, the Encyclopedia of Minor League Baseball, Retrosheet.org, and Baseball-Reference.com. i “100 Greatest Phillies: 78 – Tully Sparks” at http://philliesnation.com/archives/2009/01/100-greatest-phillies-78-tully-sparks/. ii The only contemporary reference to Beloit was found in a front-page profile of Sparks in the June 22, 1907, issue of Sporting Life. The same article called him a native of Monroe, Louisiana. iii Sporting Life, February 15 and March 7, 1896.
iv Sporting Life, May 23, 1896.
v Sporting Life, September 25, 1897.
vi Sporting Life, January 29, 1898.
vii Sporting Life, September 30, 1899.
viii Boston Globe, March 4, 1902.
ix Sporting Life, June 22, 1907.
x Washington Post, July 13, 1902.
xi New York Times, July 18, 1902.
xii Boston Globe, July 24, 1902; Washington Post, July 27, 1902.
xiii Sporting Life, November 2, 1907, March 14 and October 31, 1908.
xiv Chicago Tribune, June 6, 1909.
xv Sporting Life, October 16, 1909.
xvi Sporting Life, August 13, 1910.
xvii Washington Post, February 12, 1911.
xviii Sporting Life, November 5, 1910.